Around most parts of the United States, people don’t usually think about whether they’re going to have enough water for the day. We just turn on the faucet and presto, we have water! Around the world though, 900 million people still lack access to any type of reliable water source. Everyone deserves to have clean drinking water; it’s one of life’s necessities. So, it’s fortunate that there are engineers and scientists working towards solutions on both macro and micro levels, and there is hope in the near future to improve water availability. I recently came across the documentary spotlighting Dean Kamen’s (yes, the Segway guy) latest project, which both go by the name Slingshot, and I was quite impressed. The documentary highlights Kamen’s efforts to make water more readily available in developing parts of the world. 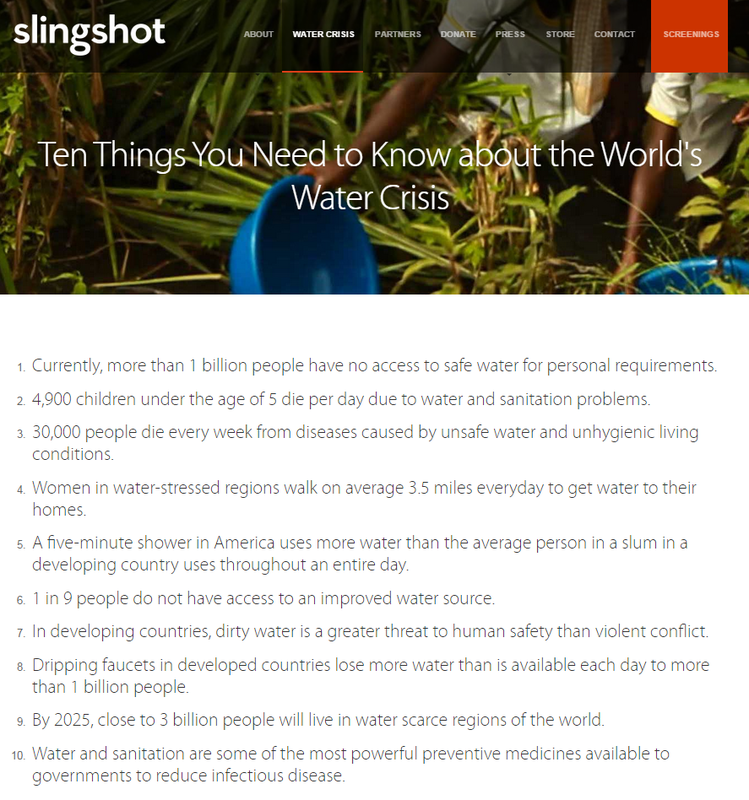 In the film, Kamen says, “Throughout my life I only started projects if enough credible people told me ‘you’re nuts’ because then you know this must be a big problem.” Slingshot is a water treatment device, and this documentary sheds light on a new feasible solution to the water crisis of today. Kamen’s device functions just as nature does to produce clean water. The machine uses a process to distill any water-based liquid to produce purified drinking at a rate of almost 30 liters of water per hour. One machine can provide enough water for 300 people; but how is it powered? If available, a source of electricity can be used, but in many regions electricity is not accessible. So in most cases, a Stirling-cycle generator is powered by any fuel source that can burn, for example cow dung—yes, cow dung, to power the Slingshot. The burning produces gases such as methane and carbon monoxide, but they aren’t released into the air. Rather, they are collected and turned into heat to power the generator, so instead of producing toxins the generator is cleaning the environment as well. Kamen speaks to the innovator in me when he says, “Through the world of engineering, I wanted to start applying the rules by which our Universe operates to create inventions that would give people a better quality of life…” This sentiment captured my attention; it’s one of the reasons why STEM education is so important, and why bridging the water innovation gap is an industry priority. Day-to-day, we may not realize the issues many people face, but engineering is one mechanism to find solutions. 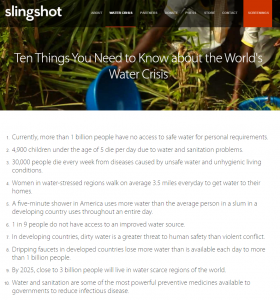 Like any new technology, the Slingshot faces challenges along the way, but when they are solved, the value of this technology will help millions of people who currently live without a clean water source. It’s promising to see a new technology that could aid in a solution to the water crisis that so many people are experiencing.